After rolled out technical previews for Microsoft Office 2016 for Home, Microsoft finally revealed more information of Office 2016 for Business Previews and opening up its program to allow anyone who agrees to a non-disclosure agreement to download the software and test it before it goes on sale. In addition, Microsoft also announced it latest product Skype for Business at its Convergence conference, with the promise of giving organizations reach to Skype users outside of their business’ walls. Microsoft is launching an Office 2016 preview aimed at IT professionals and developers. Microsoft Office 2016 looks similar to Office 2013 but includes some UI tweaks and new features – Tell Me tool to help users get acquainted with Office and an automatic image-rotation feature. With Tell Me tool, users can ask the help assistant how to perform a task in Office. Furthermore, Office 2016 also improve Outlook 2016 search, storage footprint, and email delivery performance, alongside some improvements to image insertion in Word 2016 and Excel 2016. However, this early build doesn’t yet contain all the features in the final product. Anyone can sign up for Microsoft’s Office 2016 preview right now under the terms of the NDA in Microsoft Connect site. Just enter the email address to receive an invitation to participate in the preview. After enter the email address, users will be able to download the necessary bits to install the preview on system. Another product, Skype for Business looks very similar to the consumer version of Skype. The new app offers some additional flexibility for businesses with integration directly into Office which allows users to connect via Skype from Outlook. 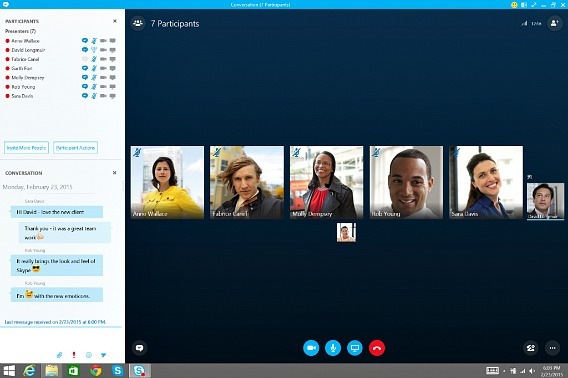 Skype for Business also connects Lync customers with any Skype user. Final version of Skype for Business will be available in April, however interest users can sign up to the preview at Microsoft’s evaluation site.